Home » Beijing » The Worship Of Heaven & Earth! The Worship Of Heaven & Earth! I have always been captivated by images of this marvelous, triple roofed, vibrantly painted building. Supposedly built entirely of wood without using a single nail, ‘The Hall of Prayer for Good Harvests’ is considered one of the best examples of traditional Chinese architecture. Imagine my surprise then, to discover that this building is not actually a temple and does not house the main altar of the Temple of Heaven. That its blue glazed gables, were originally painted blue, yellow and green, to denote Heaven, Emperor and nature AND that the timber used for the rebuilding in 1892, was shipped all the way from – no kidding – Oregon in the US of A! I caught myself wondering, if the glaze on those shiny pillars could be melamine (It is not). Still, at 36 metres wide and 38 metres tall it is a gorgeous building and worthy of admiration. ‘Tiantian’ as the Temple of Heaven is called in Mandarin, actually refers to the main altar and the oldest and holiest part of this complex, the ‘Altar of Heaven’. This is a single flat round stone, set in the centre of nine concentric cricles of stone paving, in multiples of nine. Nine being an auspicious number representing the Emperor. The altar was originally paved with blue glazed tiles and replaced with the present marble in the 17th century. The ancient ritual of the worship of Heaven and Earth in the holy Mount Tianshan was started by – who else but First emperor Qin Shuang Di. It was shifted here by the Ming Emperor Yongle in 1420, when he moved his capital to Beijing from Nanjing. A total of 22 Emperors worshiped here by the time China became a republic. By all accounts a glorious ceremony that started with the emperor, in his role as representative of Heaven, leading a grand procession from the Forbidden city to the Hall of abstinence, where he was expected to repent & cleanse himself of his sins before he could ascend the ‘Tiantian’. I wonder how long it took, Yongle, the usurper of his nephew’s throne and the murderer of his (the nephews) entire clan, feel cleansed enough to communicate with God? 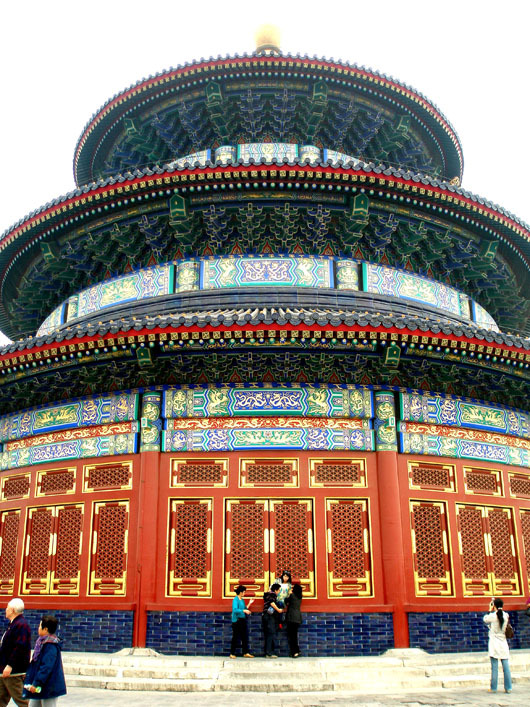 The real charm of the Temple of Heaven lies not in its hallowed architecture but in its vibrant atmosphere. We walked around a while taking in the happy vibe. Groups of people chatting, exercising, dancing, playing. A place of relaxation for common citizens that was once as forbidden to them as the Forbidden City. Playing Ti Jian Zi! We carried a couple all the way back for the kids! Wonderful and exciting. What beautiful colors and interesting history. So glad you posted this for our education and observation. Brilliant isn’t it? My pics don’t do them justice. Thank you for your comments! I would hope so unless some Mandarin was on the take 🙂 Thank You for reading! Do you think the dastardly Yongle cared much what the gods thought? I’ll bet his processions were every bit as glorious as his mandarins could make them. Just imagine, those vast spaces filled with the jewel colors of imperial silks. Shame there would have been no audience except the courtiers themselves. The colours inside are incredible. Are they original, do you know, or have they been retouched in modern times? It was heavily restored in 2005 prior to the 2008 Olympics, so not sure what is original and what isnt! In China one can never be very sure in any case! Thanks for your delightful comments! That’s interesting about the restoration work – if it’s difficult to tell which is original and which is new, that means the skills have survived. It’s a great help they’ve got the money to use the best materials, i guess. I keep thinking of poor little Lao, and the almost naive restorations I saw there. 47 million Yuan (Approx 5.9 million USD at the time) would have ensured that!! I love the colors, and you capture the scale of the place in your photographs. Again, your history and stories–like the usurping of the throne–are intriguing, and make me want to know more. Another great post, Madhu! I look forward to your posts knowing that I’m going to see something beautiful and learn something interesting, and this post didn’t disappoint! I love that the great trees of Oregon are an integral part of this beautiful Temple. Thank YOU Elisa for your kind comments! Another informative post with beautiful pictures. Madhu, you write so well that I can visualize walking there and experiencing it all…. They are really beautiful! Thank you for stopping by! Oh wow! That is so interesting! Thanks for the lovely post and photo’s Madhu! Interesting facts and pictures! A few weeks ago I also read about this interesting place on James’ blog (Plus Ultra). From your depiction, I must say that this is a must-visit place if I go to Beijing one day. It is Bama! Thank you and glad you found this interesting! Love the history and great photos! Thank you for your comments, Allthingsnice! It Is! Thank you for taking the time to read! Thanks for checking out my blog. Yours looks really interesting. Lovely photos too. Looking froward to seeing more. Thank you Kathryn! Welcome to my blog and look forward to having you around! We have been fortunate yes, but we have also had to prioritise and make sacrifices to have that happen! Oh China! I’m sure there’s a model of this temple at the Epcot Centre in Florida. That’s maybe as near as I’ll get but I enjoy accompanying you Madhu. I can’t believe all of that intricate detail is painted. I’d have guessed mosaic tile would have been used to create the designs. I’d hate to have to try to match the colors to re-paint it at a later date. The building is truly magnificent. That’s another place I definitely want to see. The architecture is just amazing to look at! Wow, great photos. So much colour and texture – it would take me ages to get through there!!! It’s really ornate as well, but in very different ways. There must have been so many artisans working on the building and its precision. Fascinating – thanks for the tour!! Lovely shots, especially that first one!